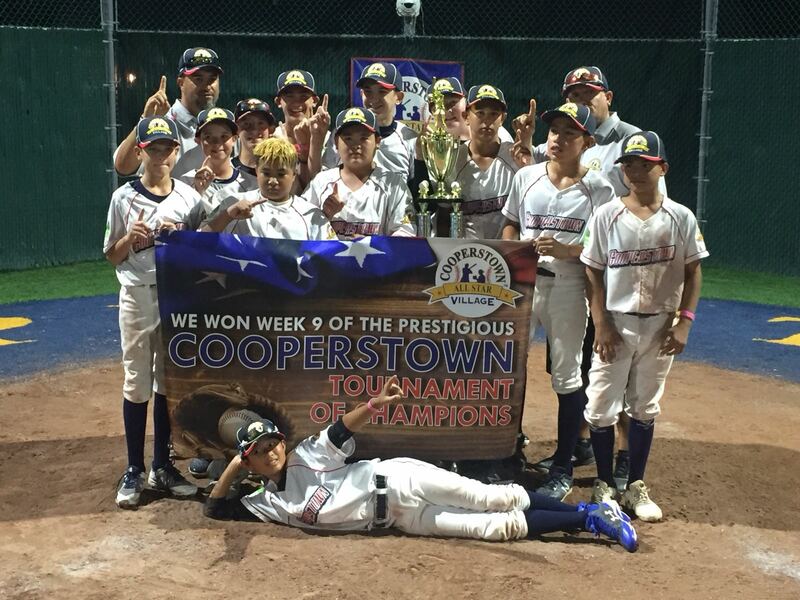 Blue Wave 12U ran the table to bring home the organization’s first-ever Cooperstown All Star Village Championship. Coach Aron Garcia’s Irvine-based team posted a perfect 10-0 record to capture the CASV Week 9 (JULY 28-AUG 3) championship in Cooperstown, NY. After posting a 6-0 record in the seeding games played over the first three days, Blue Wave needed to play and win four games on the final day of competition (THU AUG 2) to bring the title back to Orange County, CA. 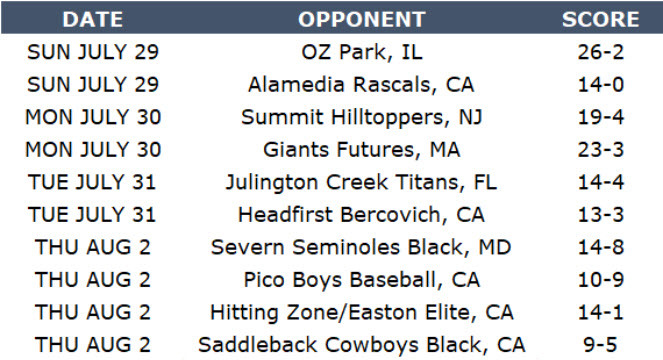 They started with a 14-8 win over Severn Seminoles Black (MD, then squeaked by the Pico Boys (CA), before blasting Hitting Zone/Easton Elite to earn a showdown with the Saddleback Cowboys Black (CA) in the championship game. Though the Cowboys were also unbeaten at 9-0 with a tournament leading 61-homeruns in those games, Blue Wave pitchers combined to keep the Saddleback bats in check while the offense scored enough runs to beat them 9-5 for the Championship. This was the eighth championship title the team has won since January, posting a record of 53-8-2 over the past seven months. Members of Blue Wave 12U are Ben Reiland, Rylan Littlejohn, Andres Vaca, Wyland Okamoto, Austen Barnett, Bryan Ho, Treyson Arita, Nolan Tillitt, Jeremiah Robles, Gio Sambito, Derek Higareda, and Luke Wilson, along with coaches Aron Garcia and Chris Reiland. The team will take August off, but returns to the ball field in September when they move up in age level to 13U and 14U teams, again coached by Garcia, who is an assistant varsity coach at Northwood High School in Irvine. Tryouts will also be held at the end of August for a new 12U team to go to Cooperstown next summer (2019) and 11U that will go the year after. “We focus on great coaching and a program that delivers consistent practices and game play to ensure the steady improvement and development of each of our players and teams,” Blue Wave President Carlos Cornejo explained. “So we look for players and parents that are committed to the process and time it takes to develop great teams like our Cooperstown Championship team. Tryout dates for the Fall-Winter 2018 season will be posted and eMails sent out as soon as details are finalized.